I'm in an ongoing love affair. I admit it. It has been going on for almost eight years now. I sneak off with her at every opportunity and ride her like, well, like a motorcycle! Even when I am not riding it (I do not really think of it with a gender...) or looking at it, I am thinking about riding or looking at it. In short, it is the most fun motorcycle I have ever owned (and last time I counted I have owned 14). The bike is an MZ Baghira. MZ is a storied brand that no longer does business in America because the current owners are/were insane. I believe that the brand is now totally defunct. This bike was designed as an off/on-road motorcycle similar in concept to BMW's F650. 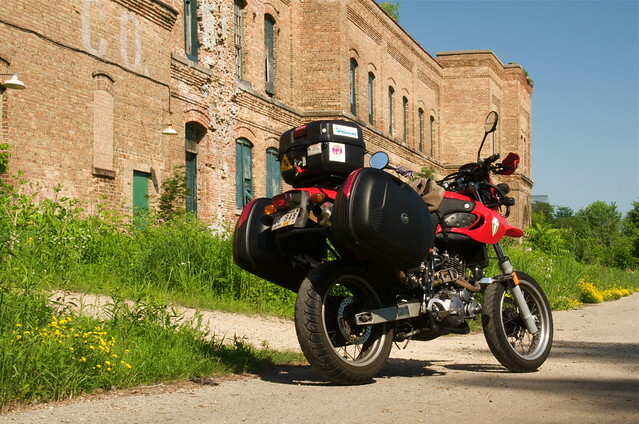 In Europe (where this bike was built) there has been a fad to take off-road motorcycles and put street wheels and street tires on them, a sub-class referred to alternately as supermotard or street moto (the link cracked me up, and I was keenly disappointed that my Baghira was not in the list!). I used mine that way, as a hooligan bike for a while but discovered that the large single-cylinder engine worked pretty well for distance too. Over time I made changes to it to improve overall ride-ability until it became clear that I had crafted a pretty darned good "urban bagger" (a motorcycle with dedicated hard luggage bags). 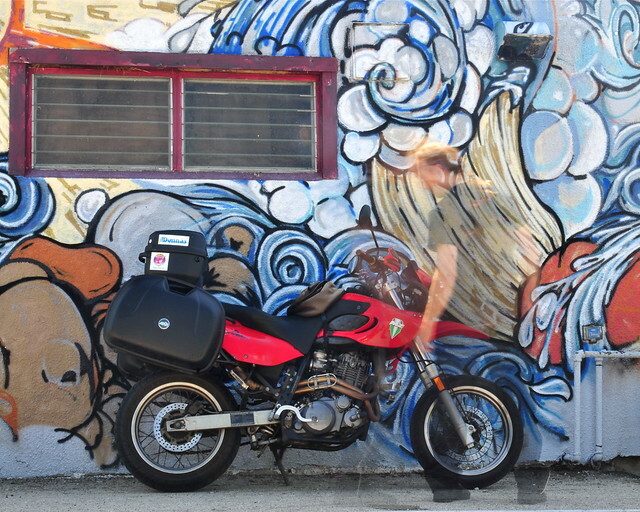 I had a seat built to enhance comfort, swapped hand grips, added some specifically designed edging on the vestigial fairing to break up the wind (which works amazingly well), and of course, added Givi hard luggage. I also had engine work done that boosted horsepower 20 percent and torque almost as much. Now I have a bike that is superbly practical for a wide variety of uses and is a blast to ride. The potholes and generally crappy street conditions do not phase this bike one bit as the off-road suspension just absorbs it all. The only down side is a tiny 13 liter gas tank that only lets me get around 115 miles before switching to reserve and needing to hunt for a gas station. I have done long trips on it, the longest of which was 3,400+ miles around all five Great Lakes. I am pretty sure I will own this bike until it is used up. Waa-hoo!